Kimba, the White Lion was one of the most popular TV cartoons of the late 1960s. The show came from Japan, where it began as a famous 1950s children's comic-art novel, Jungulu Taitei [King of the Jungle] by Osamu Tesuka, who was already popular for his Astro Boy character. The TV Kimba is a simplification of the novel. Big-game hunters kill the mighty Caesar, king of the jungle, and capture his queen, Snowene. Kimba is born on the boat that brings his mother to a zoo in Europe, but he escapes, and he returns to the African veld. Caesar's old friends, led by wise old Dan'l Baboon, Bucky Deer, and Pauley Cracker the parrot, try to help Kimba realize his place as the young Prince, but Kimba wants to be more than a strong fighter like father. He is impressed by human civilization and he wants to create a similar animal civilization where beasts will not have to prey on each other. This stirs the opposition of many animals. Even the friendlier carnivores point out that he is basically asking them to starve to death. Despite the serious tone of the story, the 52 episodes that were syndicated in America in 1966 were kept light and humorous, and were designed to be seen in random sequence. But the Japanese public familiar with the cartoon-art classic had some awareness of the chronology of the TV episodes. Kimba begins as a babyish cub, acknowledged as the Prince but considered an impractical dreamer by all but his closest friends. Gradually, he accomplishes his goals (including finding a "Meat substitute" for the carnivores) and convinces the other animals of the value of his "civilization." By the last episodes, he is a husky teenager and his peaceful animal kingdom is solidly established. 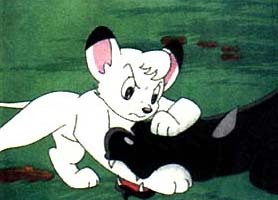 Kimba was a Japanese cartoon, but the name is American. In the original Japanese, Jungulu Taitei, he's Leo the Lion. NBC, which bought the American rights, considered this moniker too unimaginative. They instructed producer Fred Ladd to change the hero's name to something more original. Ladd's team of writers and dubbers, led by Cliff Owens and Billie Lou Watt, took the Swahili word for lion, simba, and changed the initial letter to create Kimba- a unique name. Tezuka tried to use this message in most, if not all, of the anime/managa he made: Love all creatures, love eveything that has life, even it that thing is ugly, it might have a pure heart.